Hey all! A relatively early workbook report today, what the hey! So, what’s been happening today? Well, I did the final lightmap build of Chamber 2, in preparation for the testing build. I also added a bit of a visual reward at the end of the level, similar to the bridge at the end of the first one. I also discovered a bug in one of my scripts which only occurred at one place where it was used, but I adjusted the script so that the bug would not happen in any instance. I’ve also written the form in preparation for the testing of level 2, so pretty much everything’s ready for playtest! Whoo! Other than that, I also got a bit more feedback for level 1 and so I decided I’ve got enough feedback to summarize it all. So, let’s go! The form consisted of one question with a scale answer (ranging from one to five) and three questions that asked about the level more in detail. Five out of seven choose 1 as their answer, the remaining two chose 2 as their answer. From this response, I’d say it’s safe to assume that the implementations of the methods were, overall, working as intended and well at that. Most of the responses for this question commented that, just as the first question confirmed, the level was generally easy to understand. Most responses mention straight corridors and the bridge at the end as being the easiest to navigate. There were a few people who commented (on this question and the following two as well) on the room with the split paths that were lit and colored with red and green, saying that they expected the obvious path, the green one, to perhaps not be the correct one, that it was a trick to play with the expectations of the coloring. I had this sort of “side-effect” in mind when designing the room, knowing that I had personally checked the red path first just like some of the testers did, even though I’d assume the green one to be correct. The green path remained the correct one, but it was interesting to see that not only did the psychology of the coloring work as intended, but it could also potentially work if the paths had been switched, making the red path the one leading forward. A form of reversed psychology, if you will! Out of the seven testers, four of them commented that the very first room was the most difficult one. The layout was more irregular than the others and some playtesters had some minor difficulties finding the very first door, since it sort of blended in with the environment. As I mentioned some posts back, this issue has been addressed already. I changed the layout of the room to be less confusing, as a result I feel that the design of the room is more consistent with the rest of the level as well. 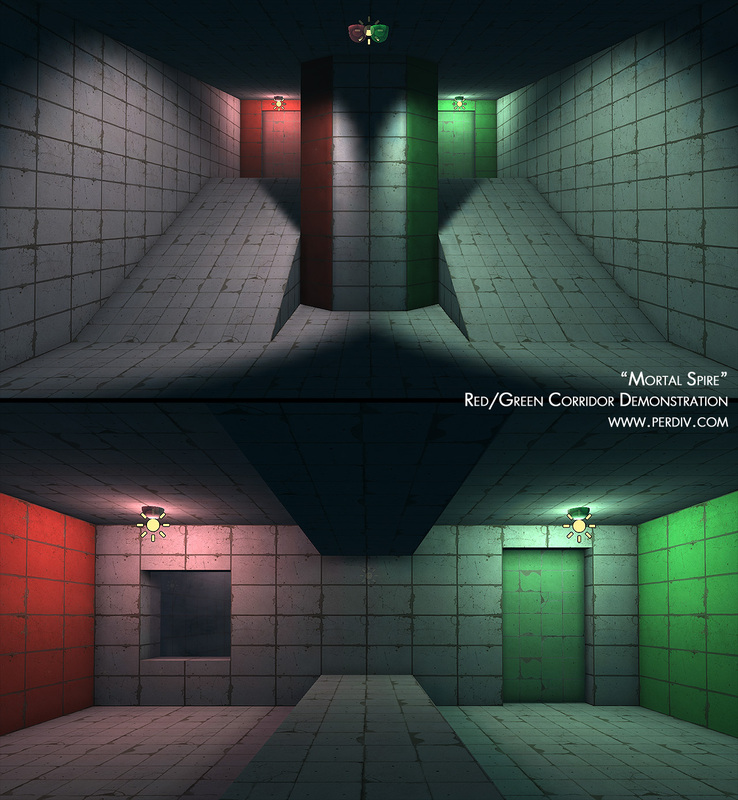 As with the previous question, there were comments relating to the red/green paths and how testers expected the psychology of the coloring to be reversed. From this, I got a lot of useful, more general feedback for the level. The testers seemed to like it overall, saying that it was good and easy to understand and follow along. A couple of comments mentioned the final part, the Interval bridge, saying that it was a nice break from the inside environments, with the sun shining and the more decorative elements. I’d say that this confirms that the Interval worked as intended; a final break before going to the next level, a visual reward where players are treated to something more open and bright. There were also some very useful critique poins. These comments pointed out; that there were graphical glitches with the doors (sides being bright where they should be dark, which I’ve fixed), the highlighting of the buttons being too obvious (made the buttons themselves slightly darker), that some of the design was too straight-forward (which I’ve tried to change with the second Chamber, we’ll see how it works after the test of it) and that the physics of the player was a bit floaty and slow. I’ll try to look into the physics aspect if I have the time, as I also noticed that the player felt very floaty after reading the comment. Overall, the comments were very useful and varied! I’d like to thank all the testers once again for their great help, thanks a lot, everyone! You know who you are! Phew, that’s quite the post! I hope you’ve enjoyed reading this test summary as much as I enjoyed reading the feedback. I’ve prepared a few more questions for the second test, being more specific about some parts. I’ll probably do the tests and maybe even compile the results of that tomorrow, seeing as how I’ve got the form and build done and ready. That’ll be all for now though. Until next time!